An Associate Project Manager acts as an intermediate between the Project Manager and the rest of the team, the primary job description falls nothing short of the following – identifying problems, offering best possible solutions, participating and managing evaluations; administering working of the team in all phases of project, developing project plans, designing project methodologies, analyzing risks in the project, maintaining and ensuring safety regulations, evaluating and preparing reports and monitoring project from scratch till the finish. The qualities needed to excel in this line of operation are – excellent planning, a keen eye for details, an ability to work under pressure and an excellent knowledge of MS Office and project management software. Candidates are expected to portray in the Associate Project Manager Resume a degree in the field of business administration or public administration. Objective : Results-driven Associate Project Manager with over 3+years of experience in project management support, working with cross-functional business units supporting the company's leadership vision through execution. Proven highly effective team-building skills. Created a master schedule for each new project, based on the statement of work that was agreed upon by the client. Created weekly outlooks to make sure that the team and business were meeting agreed upon milestones with the client. Created a production schedule for the client, so that they would know when they could expect to review and give feedback and approve their project. Following-up daily with the team to make sure milestones were met. Implemented and lead daily stand up meetings with management, creative and social media teams. Communicated with clients if the creative team needed any assets to complete the project. Coordinated with developers to estimate upcoming development projects. Worked with developers to make sure they were meeting the agreed upon milestones. Coordinated with developers when testing was ready and made sure that the team was assigned time to start testing when staging link was delivered. Tracked additional requests as they came in from clients and assigned estimates as needed. 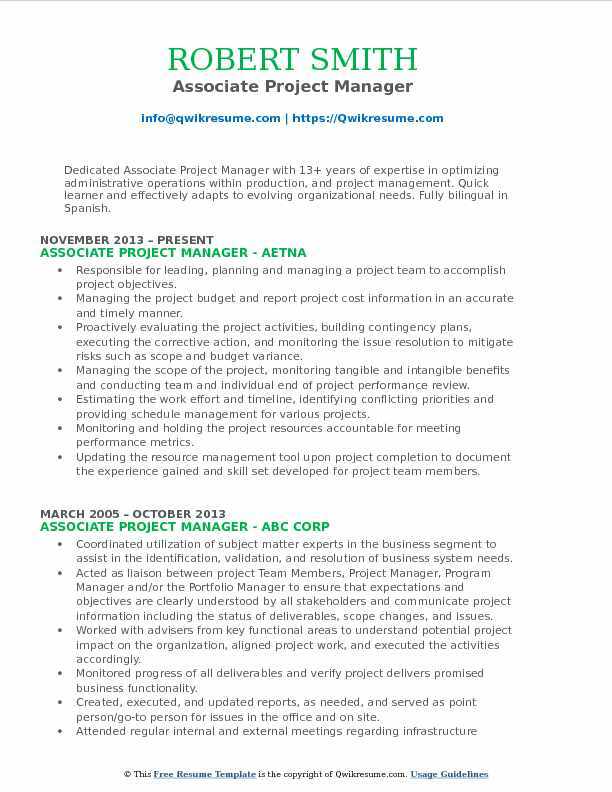 Summary : Highly skilled Associate Project Manager with more than nine years of experience in business, financial, qualitative and quantitative analysis. Demonstrated expertise in budget execution and formulation, project, program, budget, contract, waste, fleet and records management. Overseeing and delegating the tasks, scheduling manpower, and monitoring performance, ensuring optimal productivity. Training, coaching and mentoring new staff members on best practices, operational protocol, and tactics to maximize performance. Directing all project management components of engagements from strategy through execution including issue identification and resolution, communication and change management, and development of high-quality deliverables. Developing trusted advisor relationships with executive teams to deepen and extend practice reach by offering industry and product expertise. Collaborating with the client to communicate insights for advancing shared organizational goals and on-time task completion. Interfacing with the Project Managers to ensure continuity and use of best practices with client end-users. Conducting the daily calls with Internal Teams, Project Manager, and Client to provide real-time availability and notification of any discrepancies to meet the customer deadlines. 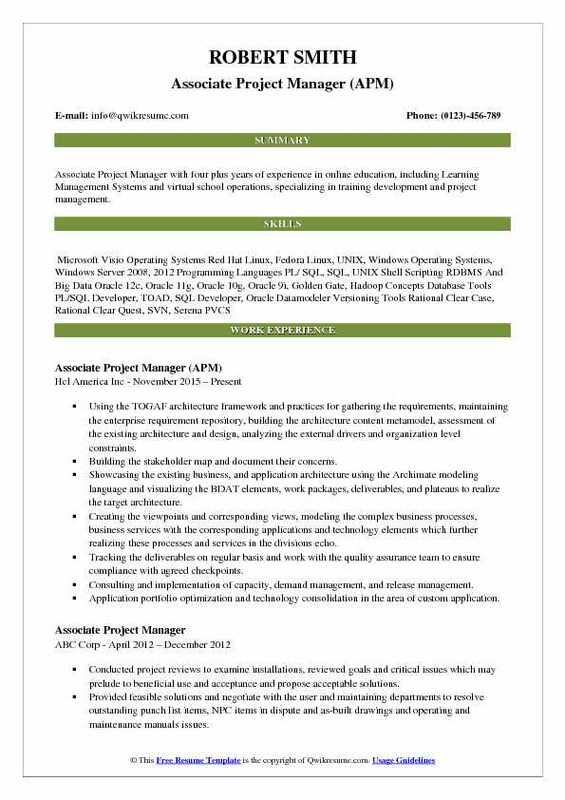 Objective : Associate Project Manager with four plus years of experience in online education, including Learning Management Systems and virtual school operations, specializing in training development and project management. Using the TOGAF architecture framework and practices for gathering the requirements, maintaining the enterprise requirement repository, building the architecture content metamodel, assessment of the existing architecture and design, analyzing the external drivers and organization level constraints. Building the stakeholder map and document their concerns. Showcasing the existing business, and application architecture using the Archimate modeling language and visualizing the BDAT elements, work packages, deliverables, and plateaus to realize the target architecture. Creating the viewpoints and corresponding views, modeling the complex business processes, business services with the corresponding applications and technology elements which further realizing these processes and services in the divisions echo. Tracking the deliverables on regular basis and work with the quality assurance team to ensure compliance with agreed checkpoints. Consulting and implementation of capacity, demand management, and release management. Application portfolio optimization and technology consolidation in the area of custom application. Summary : Motivated, goal-oriented, hardworking, and quality-focused Associate Project Manager with 11 plus years of experience with excellent clinical skills gained through hands-on experience. Good communication and organization skills. Demonstrate a basic knowledge of professional principles and skills. Involving in development of the application on customization of components, business objects etc. Resolved the Documentum performance issues for the client by solving out of memory, no session issue, and inbox performance problems. Responsible for analyzing and investigating the root cause of the support issues and provide resolution on the issues. Responsible for providing the technical solutions to the business requirements. Involved in troubleshooting and repairing the problems of the production environment. Responsible for resolving most difficult problems on the project and to find the root cause/resolution. Working with the client team to ensure correct deliverables on time and also with client process and methods. Responsible for working with the vendor(EMC) to resolve out of the box issues on the products used by the client application. Writing and updating the design specification, configuration specification, system administration and job aid document. Summary : A resourceful, diligent and dedicated Associate Project Manager with over ten plus years of management experience relating to projects and administrative procedures. Outstanding, negotiation and organizational skills. Attentive to detail with a logical and analytical approach to solving complex problems and issues. Articulate and proactive combines a professional and confident approach with excellent interpersonal skills and can communicate concisely at all levels. Reviewing and analyzing the beneficial use request to ascertain that all required pre-final inspections are performed. Conducting project reviews to examine installations, reviewing goals and critical issues. Coordinating the inspection schedules and prioritizing the workload in order to advance projects with the Construction Manager and user/maintaining groups and coordinating with sponsor department representatives to evaluate. Reviewing and analyzing acceptance request to ascertain that all inspections are performed, no punch list exists and all deliverables received or an acceptable solution made. Reviewing and analyzing the final payment requests for conformity and completeness. Coordinating with capital payments, law department, capital accounting and risk management to resolve critical and complex issues relating to final payment request and preparing accounting, litigation, and insurance. Conducting field visits and meetings to provide feedback on contractors progress of the project and ensure accuracy. Headline : Associate Project Manager with 5 years of experience, a strong collaborative leader with interpersonal skills, management knowledge, in-depth operational experience, technical savvy and cross-functional communication abilities. Experience leading teams in Project Management, IT, Client Support, Billing, Healthcare and Customer Service. Reviewed and assigned projects to project managers for the carrier organization based on individual pm territory, product responsibility and circuit bandwidth size us wide for cell tower and carrier access products. Event organizer for on-campus team meetings, hosting non-local manager visits and team events off campus. Captured, distributed and maintained weekly meeting minutes for 18 team members. Conducted regular salesforce data quality reviews and resolved irregularities in data. Developed and published standardized project flow dashboards and reports for Sr.Manager, team leaders and individual project managers allowing summary overviews of all projects current stages, status within each stage and drill down capabilities to view those individual projects for additional detail. 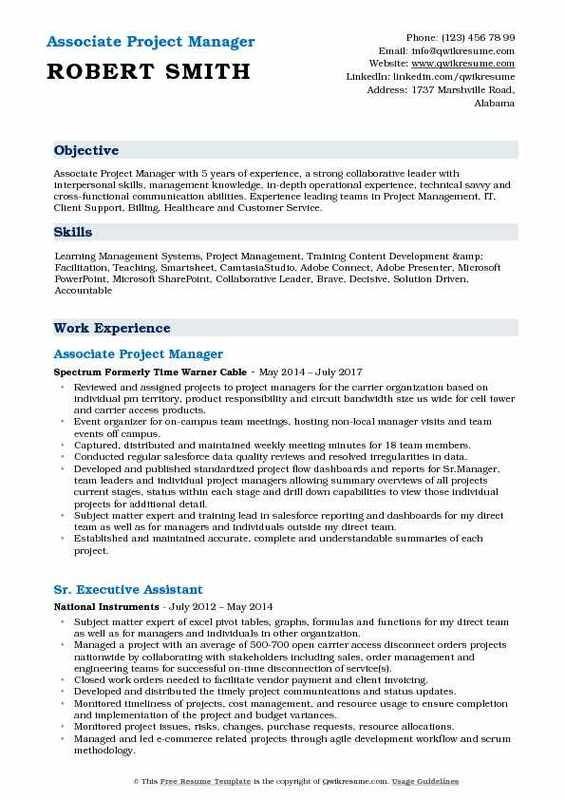 Subject matter expert and training lead in salesforce reporting and dashboards for my direct team as well as for managers and individuals outside my direct team. Established and maintained accurate, complete and understandable summaries of each project. 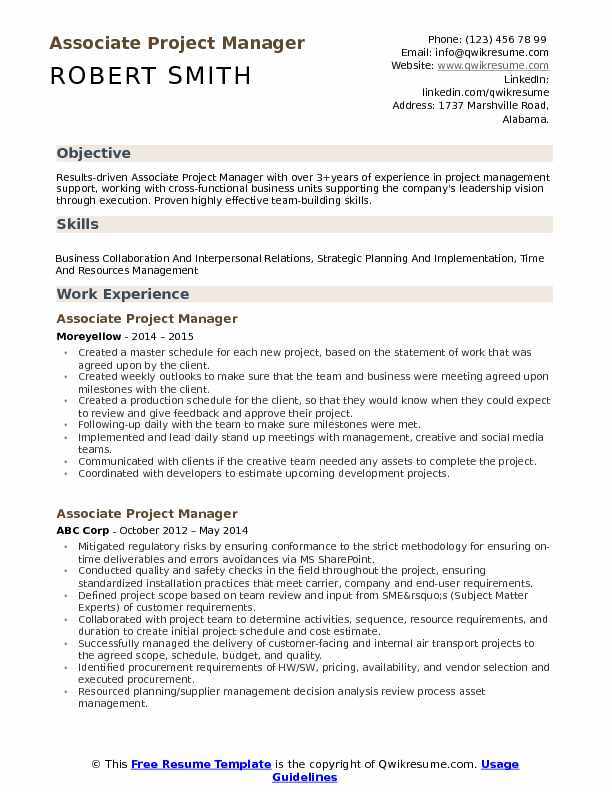 Summary : Dedicated Associate Project Manager with 13+ years of expertise in optimizing administrative operations within production, and project management. Quick learner and effectively adapts to evolving organizational needs. Fully bilingual in Spanish. 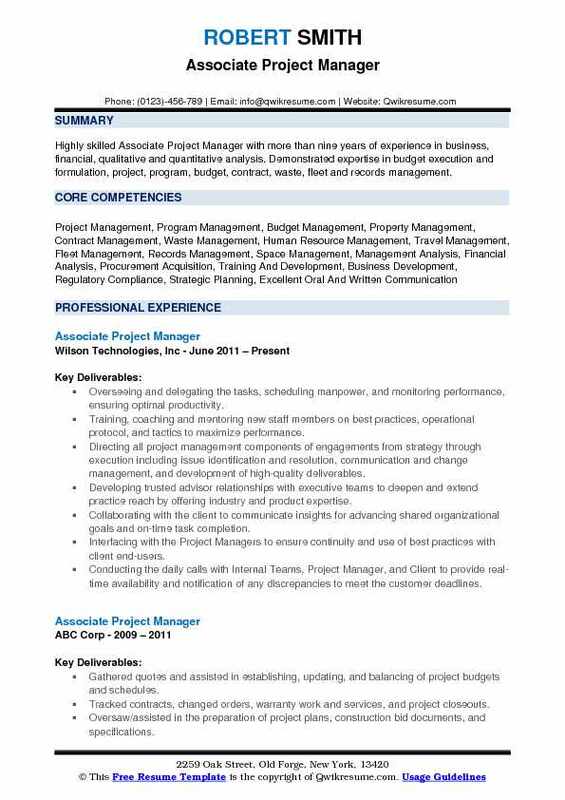 Responsible for leading, planning and managing a project team to accomplish project objectives. Managing the project budget and report project cost information in an accurate and timely manner. Proactively evaluating the project activities, building contingency plans, executing the corrective action, and monitoring the issue resolution to mitigate risks such as scope and budget variance. Managing the scope of the project, monitoring tangible and intangible benefits and conducting team and individual end of project performance review. Estimating the work effort and timeline, identifying conflicting priorities and providing schedule management for various projects. Monitoring and holding the project resources accountable for meeting performance metrics. Updating the resource management tool upon project completion to document the experience gained and skill set developed for project team members. 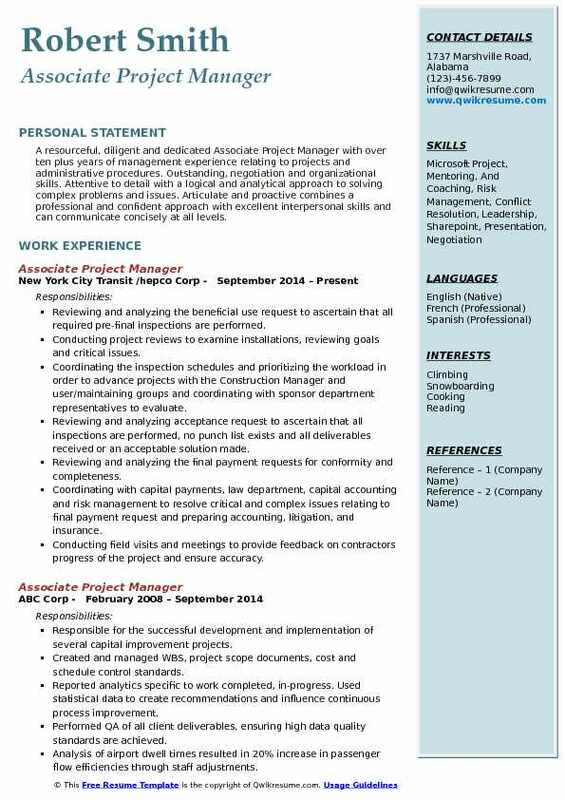 Summary : Highly motivated, results-oriented Associate Project Manager with attention to detail and 11+ years of diverse work experience in the healthcare industry seeking to obtain a position that supports the growth of a company and the opportunity to utilize my project management acumen, technical skills and educational background in a challenging and fulfilling work environment. Skills : Project Management Tools: MS Tenacious Process & Technical Dynamic Self-starter, Team Player, Project, Open Workbench & Clarity, Multitasked & Results Oriented. Functioning as an associate project manager to successfully manage and implement cross-functional tier 1-2 projects of various sizes, complexity, including complex initiatives with significant impacts to the enterprise. Working in collaboration with diverse project resources including IT and Business Representatives, Business Analyst, Developers and Test Manager to successfully implement the project within the approved budget and time. Creating/building/updating project documentation including business cases, project charters, project plans, schedules, risk/issue logs and status reports. Setting priorities define dependencies, schedule activities, prepare acceptance criteria and organize work estimating time and costs appropriate to the stage of the project. Adhering and following the corporate process to ensure the project is compliant with legislative, regulatory IT. Leveraging the company's cost management process to effectively track cost, time, resources and other factors that impact the approved project budget. Communicating the project variances related to actual project hours and costs against the project estimates and budget to project leadership. Effectively communicating with the project stakeholders, staff, and management on a timely basis on status, issues, risks, project goals, and objectives. Prepare and present executive level presentations and status reports. 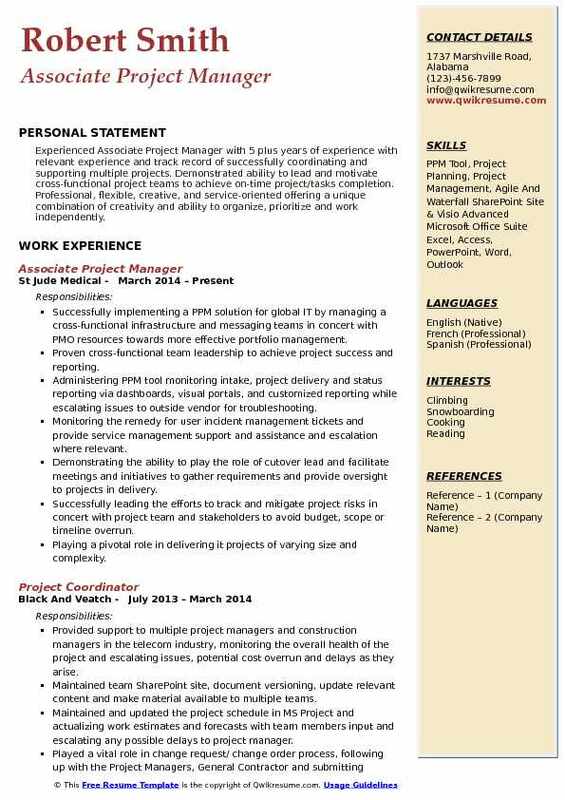 Headline : Experienced Associate Project Manager with 5 plus years of experience with relevant experience and track record of successfully coordinating and supporting multiple projects. 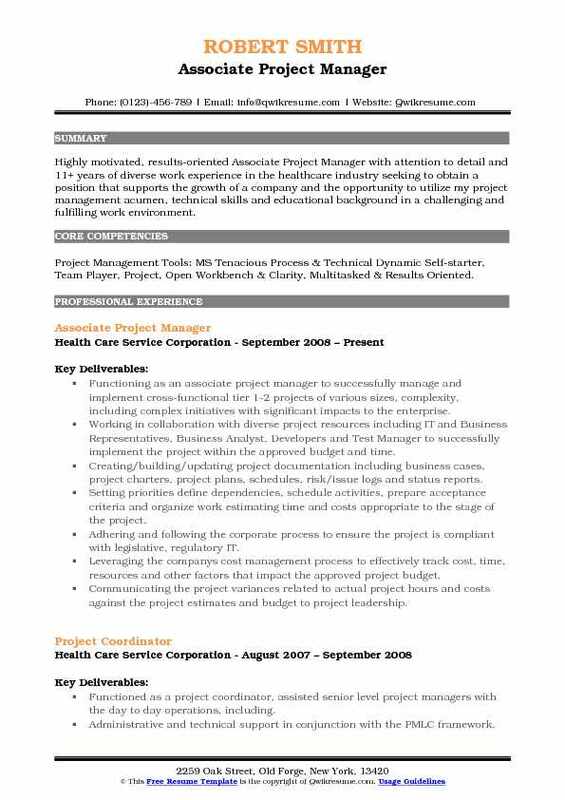 Demonstrated ability to lead and motivate cross-functional project teams to achieve on-time project/tasks completion. Professional, flexible, creative, and service-oriented offering a unique combination of creativity and ability to organize, prioritize and work independently. Successfully implementing a PPM solution for global IT by managing a cross-functional infrastructure and messaging teams in concert with PMO resources towards more effective portfolio management. Proven cross-functional team leadership to achieve project success and reporting. Administering PPM tool monitoring intake, project delivery and status reporting via dashboards, visual portals, and customized reporting while escalating issues to outside vendor for troubleshooting. Monitoring the remedy for user incident management tickets and provide service management support and assistance and escalation where relevant. Demonstrating the ability to play the role of cutover lead and facilitate meetings and initiatives to gather requirements and provide oversight to projects in delivery. Successfully leading the efforts to track and mitigate project risks in concert with project team and stakeholders to avoid budget, scope or timeline overrun. Playing a pivotal role in delivering it projects of varying size and complexity. Use project scheduling and control tools, primarily MS Project to monitor projects plans, work hours, budgets and expenditures. 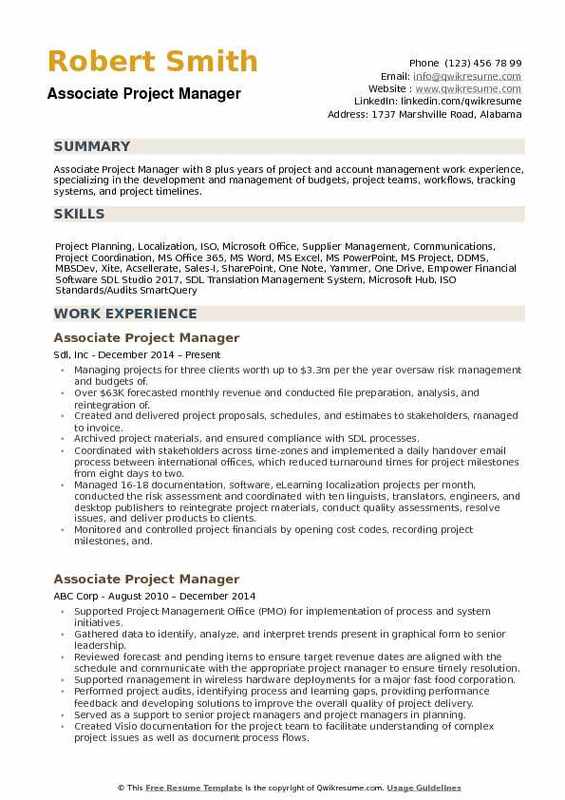 Summary : Associate Project Manager with 8 plus years of project and account management work experience, specializing in the development and management of budgets, project teams, workflows, tracking systems, and project timelines. Managing projects for three clients worth up to $3.3m per the year oversaw risk management and budgets of. Over $63K forecasted monthly revenue and conducted file preparation, analysis, and reintegration of. Created and delivered project proposals, schedules, and estimates to stakeholders, managed to invoice. Archived project materials, and ensured compliance with SDL processes. Coordinated with stakeholders across time-zones and implemented a daily handover email process between international offices, which reduced turnaround times for project milestones from eight days to two. 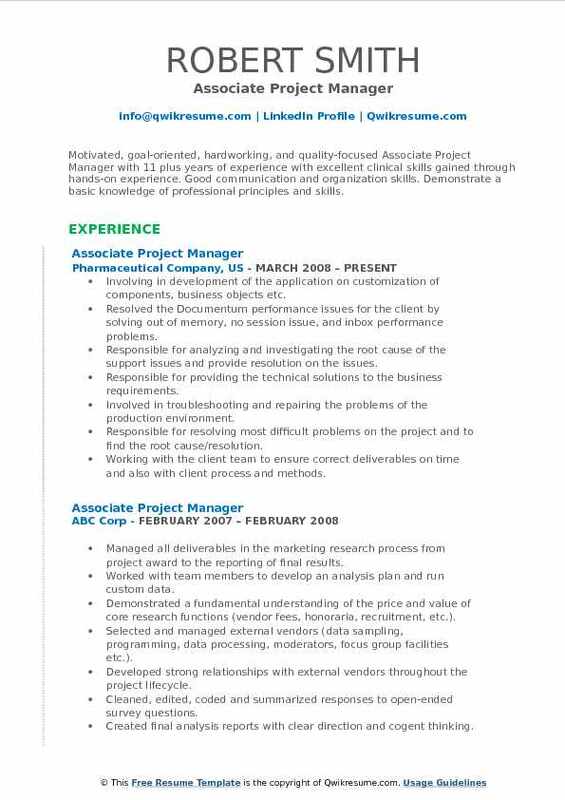 Managed 16-18 documentation, software, eLearning localization projects per month, conducted the risk assessment and coordinated with ten linguists, translators, engineers, and desktop publishers to reintegrate project materials, conduct quality assessments, resolve issues, and deliver products to clients. Monitored and controlled project financials by opening cost codes, recording project milestones, and. Oversaw projects for the GE non-life sciences group and implemented effective solutions for clients to ensure customer satisfaction and retention, which increased annual revenue by $63k.